A whole lot of Dallas lawyers are going to work today in a building that’s making national news. 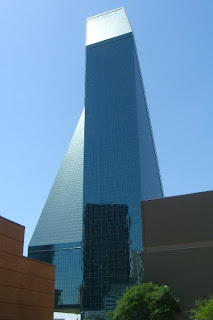 Fountain Place, 1445 Ross Ave., in downtown Dallas was reportedly the scene of an attempted terrorist attack foiled by undercover FBI agents on Thursday. According to The Dallas Morning News, a man was arrested after he parked a vehicle -- packed with fake explosives supplied by the FBI as part of a sting operation -- in the underground parking garage of the building. The building is home to the Dallas offices of two large firms, Hunton & Williams, which employs about 120 lawyers, and Bracewell & Guiliani, which employees about 50 lawyers. The incident brought back many memories for Jonathan Neerman, an associate with Hunton & Williams who was working as a CIA agent and counterterrorist analyst on Sept. 11. Like many lawyers who work in the building, Neerman didn’t learn about the incident until after work hours. “I immediately had flashbacks to 9/11 and 9/12. The questions we were trained to ask were the same ones I have been thinking about for the last 12 hours," Neerman says. “Is he working alone or with a group? Did he select the target or did the FBI select the target? Was he doing it on behalf of an organization or an organization internationally? What were his methods?" Neerman is "a committed conservative Republican, and President of the Dallas County Young Republicans." HOUSTON'S BOBBY EBERLE, ANOTHER YOUNG REPUBLICAN OFFICER, CLAIMED TO HAVE WITNESSED FLIGHT 77 SLAMMING INTO THE PENTAGON ON 9/11/01: " .... Bobby has been recognized as a leader in conservative politics, including being profiled in USA Today (as one of five new "powerbrokers" of Internet politics) and Insight Magazine (for using the web to spread the GOP story). Bobby has appeared on MSNBC's Scarborough Country and has been a guest on numerous radio programs including Bloomberg Radio, the G. Gordon Liddy Show, and Fox Radio. Bobby has served in conservative, Republican leadership roles at the county, state, and national level. 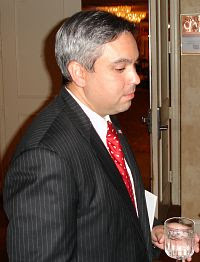 He was a delegate to the 2000 Republican National Convention for Texas and covered the 2004 Republican National Convention as a member of the Internet media. He served as the state chairman for the Texas Young Republican Federation, and as the Vice Chairman at Large for the Young Republican National Federation. ... "
"Eberle said he saw AA 77 crash into Pentagon on 9/11 ... 'Eberle said his interest was further heightened when, during a trip to Washington, he witnessed American Airlines Flight 77 crash into the Pentagon on Sept. 11, 2001.' ... "
Q: Did Eberle wave at Alfred Regnery as they watched the carnage at the Pentagon? FAST-FORWARD TO FASCISM PROMOTION BY BOBBY EBERLE ON OBAMA, TERRORISM: " ... Eberle, posting on a Republican Party site called The Loft, said Obama 'and his team have no limits on what they will do or say in order to inject socialist views into the minds of Americans. They also have absolutely no respect or appreciation for the American way and the sacrifices Americans have made in order to stay free and to promote the American way of life across the globe. Just take the latest effort being pitched at BarackObama.com. Rather than remembering the Americans who lost their lives during the terrorist attacks on September 11, 2001, Obama's political team wants you to make phone calls on 9/11 to fight back against 'Right-Wing Domestic Terrorists,' ... "
" ... Jonathan served our country as an intelligence officer with the Central Intelligence Agency. He received numerous commendations for his service on the Balkans Task Force. In the aftermath of the September 11th terrorist attacks, Jonathan worked in the Counterterrorism Center, where he provided daily briefings to senior policymakers on global terrorist threats. ... "
" ... [Jonathan Neeman] was recruited by the Central Intelligence Agency in Washington, D.C., and upon graduating from A&M served as a CIA imagery analyst. He later interned for the general counsel of the CIA while attending George Washington University Law School. 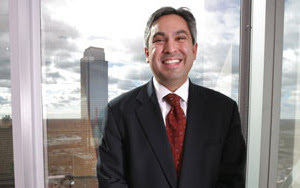 After graduating from law school in 2002, he moved to Dallas and joined Jenkens & Gilchrist, which would fold in 2007 after the firm unraveled as a result of a tax shelter scandal originating in its Chicago offices. Many of Jenkens' local attorneys, including Neerman, joined the Dallas office of Hunton & Williams. Neerman became involved in local politics, working at the grassroots level by making yard signs for Gary Griffith's successful Dallas City Council campaign in 2003, block walking for Republican Pete Sessions' congressional campaign and assisting in fund-raising efforts for Bush's second presidential bid in 2004. His efforts paid off when he became president of the Dallas County Young Republicans in 2006.... "
" ... Neerman met with several local Republican leaders and quickly earned their endorsements. His only opponent was Alan Tompkins, vice president and general counsel for three entities owned by the family of Lamar Hunt. Tompkins, however, removed his name from consideration, and Neerman was named vice chair of the party in January, officially taking the helm in May. ... "
"...Neerman says most attendees agreed the party must reach out to minorities, gays and lesbians, but only a small faction seemed willing to speak about changing the party's conservative social agenda in order to incorporate more diverse points of view. 'You've got a conundrum because you've got to broaden the party, but there are going to be segments who don't want to do the things necessary to achieve that type of outreach,' he says. ... "
FAR-RIGHT BACKLASH: "THE OLD GUARD IS NOT GOING DOWN WITHOUT A FIGHT"
" ... The question is not whether change will come [to the Republican Party], but when – and how traumatically. The old guard is not going down without a fight. In a recent Dallas Observer, Eagle Forum's Cathie Adams lays into Mr. Neerman for reaching out to gays, pro-choicers and "environmental wackos." 'Yeah, I am talking to them, and that's OK,' Mr. Neerman tells me. 'If we quit talking, we lose those people who are fiscal conservatives, pro-Second Amendment and pro-environment.' ... "
"FBI Arrests Man Trying To Place Bomb Near Fountain Place Skyscraper"
Apparently according to news reports, Smadi had been under FBI surveillance for some time after expressing “his desire to commit violent jihad” numerous times. FBI says agents arrested Smadi after he placed what he thought was a bomb at the base of Fountain Place, a 60-story skyscraper located in downtown Dallas. SMADI: TERRORIST OR "COOL" DUDE?
" ... The government says the man, who was in the U.S. illegally, spewed jihadist rhetoric and talked of killing Americans during more than six months of communications with three undercover FBI agents. The agents first encountered Smadi through an extremist Web site. But friends in Italy, Texas, about 50 miles south of Dallas, say "Sam" as he was known, never gave any indication that he was a devout Muslim, much less that he had bloodshed on his mind. They described a carefree teen who drank and smoked with friends, entertained ladies and enjoyed dancing to techno music. 'We all thought he was cool,' said Tabatha Rogers, a neighbor who sometimes let Smadi baby-sit her children, ages 2 years and 3 months. 'Come to find out he wants to blow us up because we believe in God,' she said. ... "
" ... A series of owners including Wall Street firms and even an Australian investor over the years have held title to the eye-catching high-rise. 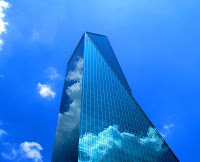 Since 2004 the building has been owned by an investment fund set up by J.P. Morgan and Fort Worth-based Crescent Real Estate." CRESCENT REAL ESTATE'S CEO IS RICHARD RAINWATER, CHIEF INVESTMENT STRATEGIST FOR THE BASS FAMILY AND "SOLDIER OF FORTUNE"
" ... As the money man behind private military contractor Sovereign Deed, which is now in the process of building a base of operations in Pellston, Mich., it looks like Rainwater is preparing to profit again by moving from Fortune to Soldier of Fortune. ... "
SOVEREIGN DEED: "NEFARIOUS ... ANOTHER BLACKWATER"
"Barrett Moore, founder of a private disaster response firm seeking tax breaks to establish operations in northern Michigan, has acknowledged for the first time that he lied about his military service and was once convicted of criminal fraud in Australia. ... "
" ... What Moore's Pentagon patrons and political allies in Michigan have not known is the true story of Moore's military service. According to U.S. Army record keepers, Moore never completed his Reserve Officer Training Corps (ROTC) program in college and was discharged from an inactive branch of the Reserves in 1994 without ever having gone through basic training. Contrary to the claims on Sovereign Deed's Web site, Moore never served as an Army intelligence officer, or in any other branch of the country's armed forces. ... "
From: "Hypocrisy and Ambition: What the Barrett Moore Story Says About America"
... The more we dug into the story the more we began to wonder which was more astonishing: the fact that Moore, as founding chief executive officer of the private military contractor, Triple Canopy, has lied so brazenly about his own military service and business success? Or the fact that neither our government nor his financial backers and business associates along the way had done the research that would have uncovered those lies? Why wasn’t he caught before, either by the State Department doing due diligence in investigating those to whom they award contracts or by the state of Michigan as it sought to bless his business with tax breaks? These failures speak volumes about the lack of accountability in a political system that distributes vast amounts of our tax dollars every year. As to why this ignominious track record would have escaped the attention of Richard Rainwater, the Texas billionaire and chief investor in Sovereign Deed, we suspect that has to do primarily with a shared vision of America’s dystopic future and a desire to profit from it. As I wrote in a previous article, Rainwater is practically obsessed with the notion of a breakdown in American society, a coming chaos that he believes will be made inevitable by a drop in oil production and resulting price shocks that will destabilize the world economy and lead to widespread unrest in the United States. The result, Rainwater is convinced, will be riots and wars between the haves and the have-nots, and he has been thinking for the past several years about how to profit from that inevitable future. Rainwater found a kindred spirit in Moore, a man who keeps survival rations and emergency equipment in his office and whose business plan for Sovereign Deed is built around capitalizing on the coming chaos. When discussing what Sovereign Deed plans to do in front of town hall meetings in the Pellston area, retired Brig. Gen. Richard Mills explained that the company would charge a staggering fee — $50,000 up front plus $15,000 per year — for their protection services in any number of situations. In the wake of 9/11 and Hurricane Katrina, Mills spoke mostly about natural disasters and terrorist attacks, but Rainwater and Moore’s vision of America’s dystopic future suggests that the real contingencies they are planning for also include riots and other forms of social upheaval. RAINWATER IS RESPONSIBLE FOR BUSH'S WEALTH: "What George does to make a Bush buck is called 'Crony Capitalism' by commentatorJim Hightower. Case in point: Dubya's financial relationship with RICHARD RAINWATER during his tenure as Texas governor. ... It's well known that Rainwater has been a major financial backer of Bush's political career, but it's a little-known fact that he's also largely responsible for Bush's personal wealth. He's put Bush into various profitable deals, from oil and gas to real estate, but the big one was the Texas Rangers baseball franchise. Rainwater and Bush sold the baseball team to another Texas high roller and Bush campaign contributer, billionaire Tom Hicks. But their relationship didn't stop there. When Bush became Guv in '95, he put all but his Texas Rangers stock into a blind trust managed by--surprise--Rainwater. Hightower implies the financial relationship wasn't a one-way street: 'Bush is nothing if not loyal to Rainwater, who has done very nicely while his pal has been governor. Among the favors Rainwater has enjoyed: *State buildings sold to Rainwater's real estate company at bargain basement rates; *State college and public school funds invested in Rainwater's company; *A Bush-sponsored tax cut that failed, but would have cut millions in annual taxes for Rainwater; and *A stadium-financing bill backed by Bush that gave a $10 million bonus payment to a Rainwater company.' Politex, May 1999"
" ... Saudis, Richard Rainwater, George W Bush, Tom DeLay and 5.6 Ton cocaine bust in Mexico, SkyWay ... " The downed plane loaded with coca was owned by "LIT Industrial Texas Limited Partnership, a venture of Texas real estate giant Trammel Crow, the flagship corporation in the far-flung empire of billionaire speculator Richard Rainwater... ranked among the 100 wealthiest Americans, Rainwater backed George W. Bush in four separate business ventures, including the Texas Rangers ... "
" ... Dec. 5, 1990: 'Interviews with people familiar with Robb's activities at the beach indicated that [Robb] allegedly was joined on perhaps two dozen occasions by people who were heavy drug users and served federal prison sentences on cocaine and drug-related charges ... 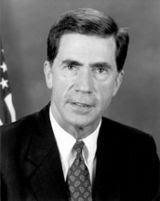 The sleaze was given even more air time when Robb's Republican opponent, Iran-Contra figure Lt. Col. Ollie North, aired ads asking, 'Why can't Chuck Robb tell the truth? About the cocaine parties' ... 'Newspapers report Chuck Robb at numerous parties with open cocaine use' ... "
ROBB'S COKE LIES: " ... There were rumors that during the time he was governor, Robb was present at parties where cocaine was used. He strongly denied this when the issue was raised during his 1988 campaign for the U.S. Senate. Robb so vehemently denied the cocaine allegation that he claimed to not even know what cocaine looked like. ... "